For all breakfast menus listed there is a minimum of 20 people. 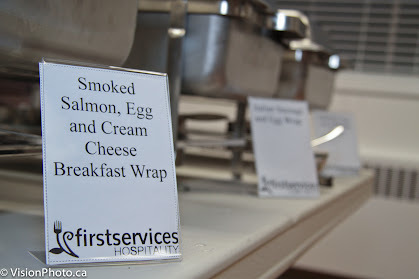 Please call today for a free breakfast quote Brenda (778)988-9440 or click here to go to contact form! Assorted freshly baked bagels, muffins, danish pastries, scones, and croissants served with cream cheese, jam and butter. An assortment of individual sized yogurts, fresh fruit, individual juices, coffeee and tea. For extra protein add our import and domestic cheese tray. Smoked Salmon, Cream Cheese and Egg, Italian Sausage, Egg and Salsa, Spinach and 3 Cheese and Egg. Served with Home Fried Potatoes, Fresh Fruit Platter, Breakfast Pastries, Individual Juices, Coffee and Tea. Your choice of either buttermilk or whole wheat pancakes served with blueberry or strawberry topping, maple syrup your choice of crispy bacon or sausage and fresh fruit platter, individual juices, coffee and tea. A variety of individual breakfast pastries, a variety of individual quiches, scrambled eggs, french toast, bacon and sausage, homemade roat herb potatoes fresh fruit platters, individual juices, coffee and tea.